Sapling Jeff MacFarlane’s two years of training at Oakcliff launched him straight towards his goal of being the first American in 30 years to win the Mini-Transat. He just completed the Solo Roma Solo race and dominated the European fleet, finishing more than an hour ahead of the second placed boat and an incredible 14-22 hours ahead of the bottom half of the fleet. This continues his podium climbing streak. 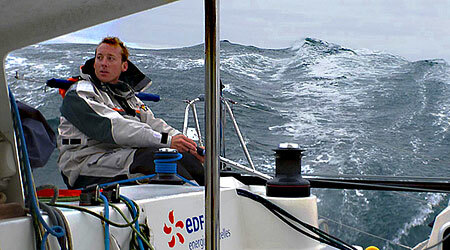 Here is his report: I started on Friday at 1300hrs in about 10 to 15 knots of breeze. The wind was coming from the N-NE. I set my big spinnaker first, but eventually changed to the medium spinnaker when the wind built to 15 to 20 knots on a slightly tighter angle. I went to the gennaker as I approached Palmarola, an island, approximately 70 miles S-SW of Rome. The constantly changing wind speeds on the first leg meant that I was constantly re-stacking the materials inside of the boat, an arduous task. By 2100hrs, I had passed Palmaroral Island, and the wind shifted to southeast. As I passed the island I took a more southerly course to ensure that I would have enough room to tack and lay the southern tip of the island. The island was much larger than I anticipated. It was completely dark, the only light visible were the flashing lights off in the distance on Ponza Island. At this point in the race, there were a few lingering thunder storms and the breeze was very unstable. When the wind reached 20-25 knots, I put a reef in the main and the code 5 spinnaker up. After no more than a half hour, the wind shifted further aft and got lighter so I changed back to the big spinnaker. Luckily, I was able to carry this sail for a good portion of the leg. As I approached Anzio, the wind shifted back to being out of the northwest, so I was able to sail upwind again. At this point, it also became extremely cold, just a degree or two away from freezing. It was impossible to escape the cold wet air – a feeling I was hoping to avoid in the Med! As the sun began to rise, I could see that my inshore strategy paid off. I was able to take advantage of the lifting breeze. I finished the race, first overall, at 0811hrs. We find Jeff’s report typical of him. Straight forward, analytical and to the point. Let us make one more point, Jeff is in need of sponsorship and donations. He is a part of the Oakcliff Travel Team and any funds donated to that fund help one of our talented, home grown teams conquer the world, or in Jeff’s case, conquer the Mini-Transat. Click here for more information.